SAGINAW, Mich. (CNA/EWTN News) — Bishop Joseph Cistone of Saginaw, Michigan has asked for prayers and some leeway in his schedule following a recent lung cancer diagnosis. 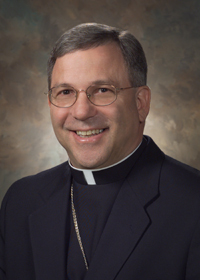 Bishop Cistone is the sixth bishop of the Saginaw Diocese, and was appointed there in 2009 by Pope Benedict XVI. A native of Philadelphia, he was ordained a priest for the Archdiocese of Philadelphia in 1975, where he also served as auxiliary bishop from 2004-2009. He also noted that parishes should not make changes regarding visits from the bishop unless they receive word directly from the bishop’s office. Cistone said that he was told by his doctors that he will experience relief of his symptoms within the first two weeks of his treatment plan, which is scheduled to be completed before Easter. Prayers daily for your complete recovery, Bishop. My prayers are with you Bishop Cistone, you were once in my parish at Epiphany of Our Lord. Bishop Cistone — remember you are OLC STRONG! Bishop Cistone, you confirmed me in February 2008 at Holy Cross Church in Springfield, PA. You are in my prayers and I hope that God allows you a quick recovery and a full life. May the healing heart of Jesus comfort and be ever present during your treatment and recovery.In my prayer and Lenten thoughts daily!!! Bishop: I’ll be praying for you. I have fond memories of your days at St. Stanislaus Parish in Lansdale, Pa. I’m sure the Lord has much more for you to do, and will restore you to full health. Keeping you in my daily devotions. George Aspen was my husband, you may remember him from Norwood Academy as it was called at one time. May you heal 100% and continue praising our Lord. Fond memories from Epiphany. Praying for your complete and speedy recovery. Keeping you in our prayers for a speedy recovery. Bishop Cistone, you are in our prayers. Wishing you peace, comfort and a complete recovery. Prayers for Bishop Cistone! I was in Epiphany and he was our priest. I cried like a baby when he left. PrYing for a speedy recovery!